Russian-Polish Jewish émigré Jacob Epstein was raised in Manhattan’s multicultural Lower East Side and settled in London in 1905. A champion of direct carving, his controversial public commissions including the British Medical Association building façade (1907−08) in London and Oscar Wilde’s tomb in Paris (1911), challenged prevailing notions of sexuality and beauty and favoured the non-European model. His portrait heads, however, were always in demand. Epstein was only finally accepted by the establishment five years before his death when he was knighted in 1954. Epstein was a noted Patron of the Society from 1936–37. He first exhibited in the Opening of the Ben Uri Jewish Art Gallery and an Exhibition of Works by Jewish Artists at Woburn House in 1934. 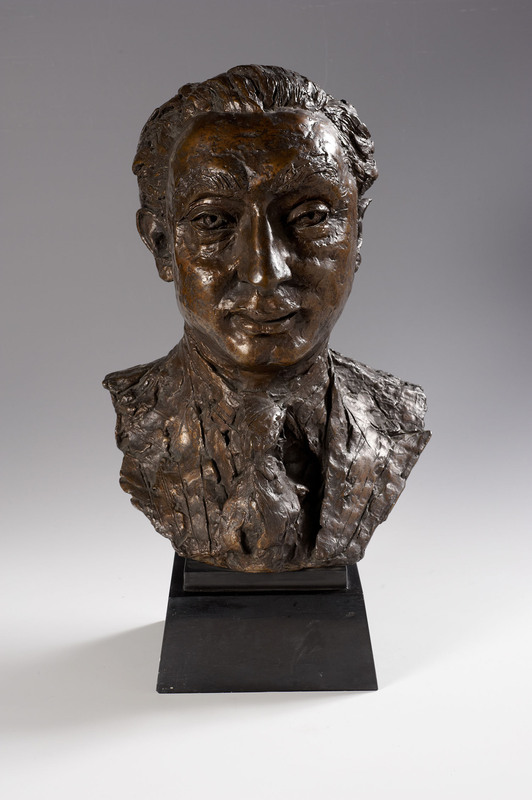 Ben Uri subsequently held a number of retrospectives including an Exhibition of Bronzes in 1959; a Centenary Exhibition in 1980; and Embracing the Exotic: Jacob Epstein and Dora Gordine in 2006. A special Epstein day tour around London led by Richard Cork was also held on 19 August 2009 to mark the 50th anniversary of the artist’s death. Alexander Margulies held a number of posts at Ben Uri including as a member of the Art and Exhibition Committees in the 1950s and later as Chairman. He commissioned the bust from Epstein, which was completed in 1942.